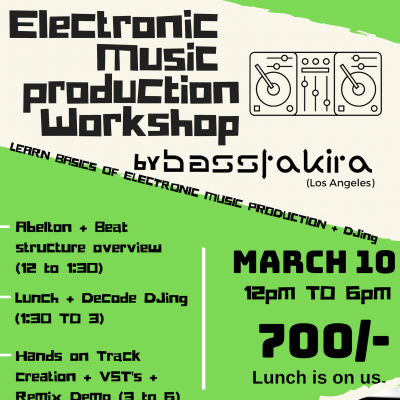 For the first time in Ahmedabad, Project Otenga team and Rishi Vyas (Bassfakira) puts together a workshop for all you Electronic music enthusiasts out there. Electronic music was born in suburbs of Chicago which was later recognised in genre of ‘house music’ as it was literally done in basements by using sound generating equipment with heavy influences of Jazz/soul music. Today electronic music expands to various genres of music from music festivals to background scores. Today, It has become inevitable art form of the industry. Have you always wondered how the ‘screaming baselines’ or ‘deep wobbles’ or ‘soulful hiphop beats’ are created from scratch? Come, join us to find out with LA based DJ/producer as Bassfakira deconstructs his flow.